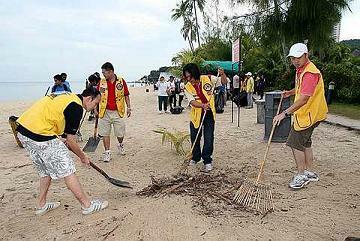 ONE hundred and fifty people turned up to rake leaves, pick up cigarette butts and cans at the Batu Ferringhi beach in preparation for the 2010 Penang Beach Carnival. State Youth, Sports, Women, Family and Community Development Committee chairman Lydia Ong Kok Fooi said the effort was aimed at creating awareness of and love for Penang’s beaches. “We want everyone to appreciate the beauty of the beaches and care for them,” she said after the cleanup on Saturday. Participants included those from Intel, Park Royal Hotel, Shangri-La Hotel, Hard Rock Hotel, National Fitness Centre, the Lions Club of Penang Light and JL Landscape Sdn Bhd.